With the new Collections Centre only a few weeks away from completion and handover, the Ensign is now being prepared for the move. Work on the car will recommence in the New Year once the new building is open and fully running. 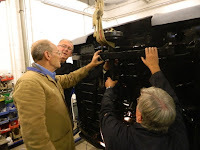 The complete restoration and repair of the body shell is now almost complete with just one small repair patch to be welded at the base of the front nearside wing where it meets the sill. This will mark the end of 18 months' hard work by the restoration team who have done an amazing job in rescuing a shell that at one time seemed beyond repair. So, the task now is to get the wheels back on the car ready for its forthcoming move into the new building. 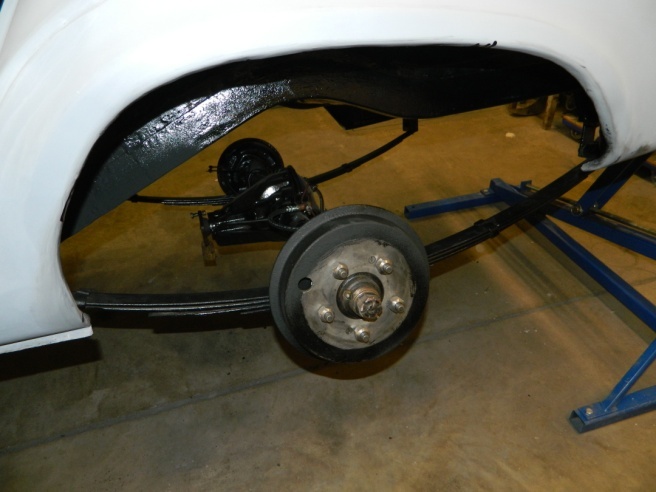 Simply put, we need to get the front and rear axles fitted to accommodate the wheels and then hopefully also get the steering column back in place. 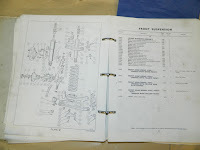 It was reassuring to find that with all the repair work carried out around this area, the front sub-frame bolted back on to the chassis with relative ease. 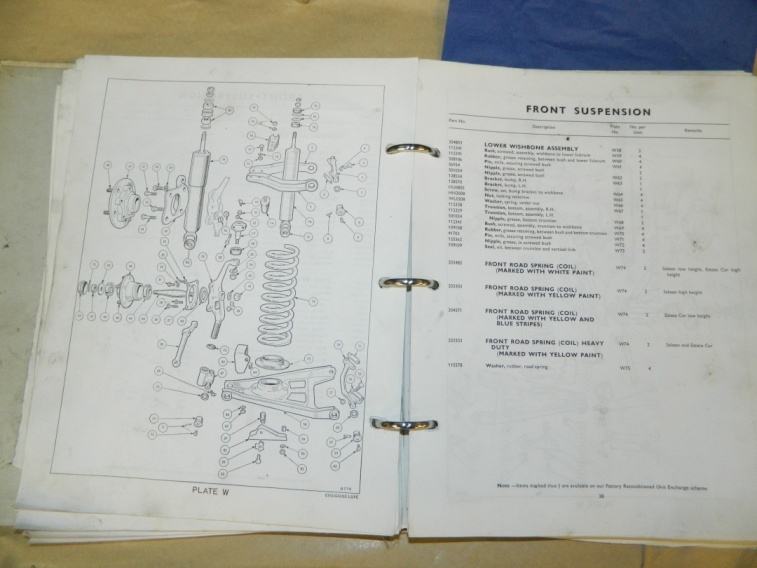 All the suspension parts had been fully dismantled and refurbished and the reassembly of so many small parts back on to the sub-frame took a little time and at first a bit of confusion. However, when in doubt, always consult the Workshop Manual and Parts Catalogue, both of which came in very useful. 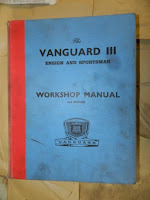 The rear axle assembly was more straightforward, but on the Ensign it is an extremely heavy item. However, with the aid of a hoist and the car over on its side, secured in the tilt frame, the axle was refitted without too much trouble. 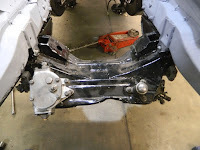 The leaf springs were fitted first and again the securing bolts and the new rubber bushes all lined up correctly on the repaired and strengthened chassis plates. The refitting of the axles has marked quite a turning point for the restoration team for at last reassembly of the car has actually started. The wheels will shortly be fitted, which will then allow us to push the car across to its new home in the Collections Centre. Work on it will continue there, but this time in full public view.